Global stock markets have been unsettled by political and economic uncertainty recently, and swung significantly between gains and losses in the final weeks of 2018. President Trump’s criticism of the Federal Reserve’s latest interest rate rise added to concerns that US consumer demand may be cooling. Meanwhile, trade tensions between America and China continue despite a temporary truce. As long-term investors, we’re committed to filtering out the short-term noise in order to remain focused on enduring investment themes. Our lead article considers General Electric’s plight and what this means for the wider bond market. Although we do not see a threat of contagion from its deteriorating credit rating, we will be watching the Fed closely as further rate hikes could turn up the pressure on bond markets more generally. After nine years of global economic growth, investors are thinking about the prospect of the next downturn. 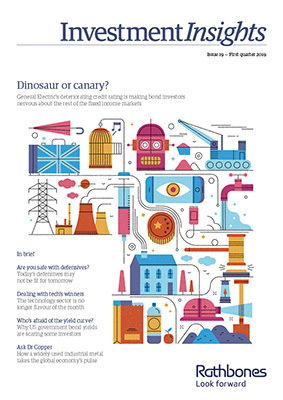 We assess the threats to traditionally defensive sectors. We consider what areas could be the next safe havens and encourage investors to keep an open mind when searching for defensives. We look at how US technology firms have blossomed in the 21st century, with other sectors unable to keep up. Yet with anti-trust sentiment rife, large US tech firms will be dependent on political developments at home and abroad to make it through the next year unscathed. At the start of December, parts of the US Treasury yield curve inverted for the first time in more than a decade. As one of the most reliable predictors of economic recession, our penultimate article explains what the yield curve is and what its inversion might be telling us. History does not suggest that investors should cut equities as soon as this happens, but a more defensive positioning within equities may be prudent. In our final article, we look to Dr Copper to take the pulse of the global economy. In particular, we find a strong correlation between the price of copper and economic growth in China, the source of half of global copper demand. But the correlation comes with a significant lag, so any prognosis from Dr Copper may not be very timely. The latest economic data from China suggests growth in the world’s second largest economy is holding up okay. We hope you enjoy this edition of InvestmentInsights.